Reusable 16 ounce plastic stadium cups personalized with choice of Christmas design and up to 4 lines of custom print on the front and back will make unique take home souvenirs at your family or company party this Christmas season. Available in a variety of cup color options, have both sides of your cups printed at no extra charge. Measuring 4 1/4 inches tall by 3 1/2 inches across the top, these dishwasher-safe plastic cups hold 16 fluid ounces when filled to the brim, comfortably holding about 14 ounces. 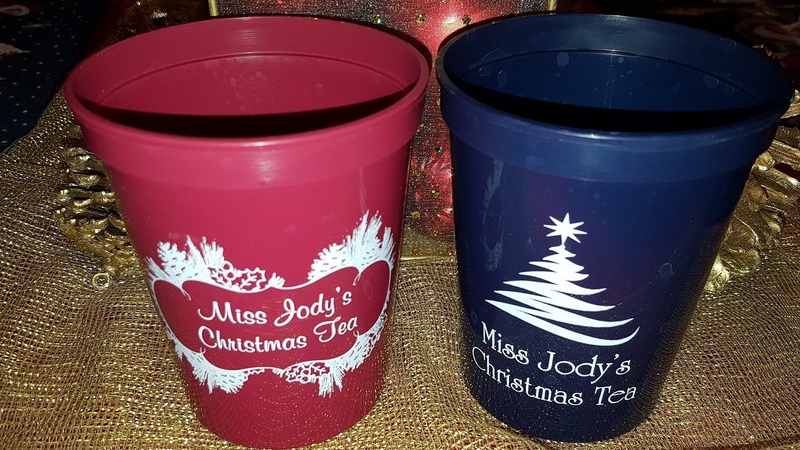 Choose from a variety of cup and imprint color options to match the theme of your holiday party. Amazing Cups! We order from you guys every year for our annual Christmas party and we are never disappointed. Easy to order and quick shipping. I ordered cups for my Christmas Tea a couple years ago. They went through the dishwasher well. The print on the cups has not faded or rubbed off. So, this year, I ordered new cups for my Christmas Tea. They are as good as the first batch. Thank you for making a product that stands the test of time! I found this company on Pinterest and was instantly intrigued. I wish I would've found them a year sooner so that I could've ordered stuff for my wedding. I ended up ordering cups for our Annual Ugly Christmas sweater party and they were a big hit. All the guests loved them as much as I did. I will def be ordering from them in the future. I loved the cups! Good quality and a great souvenir for my guest to take with them. I will order every year for my holiday party! Second year in a row ordering personalized cups for a Christmas party. Turned out amazing and very easy transaction. Great customer service! Can't beat the price as well. I'll be ordering again next year! Perfect! Turned out just as I requested. Prompt with any questions I had with the product. I will definitely be ordering again.